It looks like today will be the start of a train of northern stream disturbances to impact our area through the rest of the week. The culprit will be a large, nearly-stationary upper level low that will spin and spin across northern Canada near the Hudson Bay. Anti-clockwise flow around this low will force several weaker systems (or clippers) to pivot through the northern plains into the Great Lakes and Northeast. Looking upstream, you can already see these beginning to line up. The Wednesday clipper currently looks to be the most robust for our area. This is largely in part due to: 1) The upper level energy digging south of our area (you usually need this for precipitation to make it across the mountains) and 2) the potential for the clipper surface low to strengthen pretty quickly once it reaches the coast. These two things have been recent developments with the models so we'll have to watch to see if they hold going forward. Towards the same time as our weekend clipper, models are insistent on the development of a southern stream system. There's a timing issue here which is why it doesn't look like they'll team up to produce a big storm (we instead see the southern stream system slide out to sea). This seems to fit the overall pattern as the Pacific jet continues to be fast and overpowering...not allowing troughs to truly dig into the east until too late. There's still a slim chance we could "thread-the-needle"...but the better bet is for the southern system to miss all-together and leave us grazed by another minor clipper. 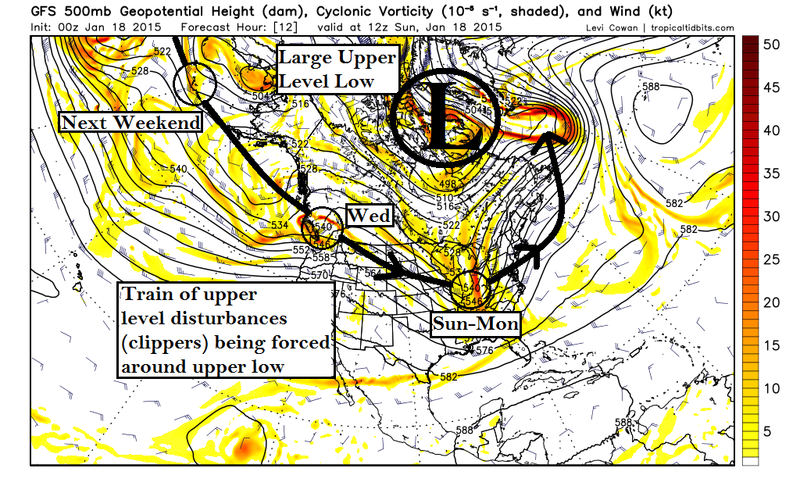 Looking ahead past next weekend...I think this clipper pattern will continue. This isn't the best for snow lovers...but certainly not the worst either. Today: Mostly cloudy with a stray sprinkle. We will be sandwiched between heavier rains along and east of I-95 and rain changing to snow along the western facing slopes. Highs: 47-50. Tonight: Decreasing clouds in the Valley. Upslope snow will really start to get going across the favored higher elevations of WV and parts of far western VA. Lows: 28-31. Monday: Upslope snow showers coming to an end. Mostly sunny. Highs: 43-46. Tuesday: Increasing clouds. A few rain/snow showers developing late. Highs: 45-48.